Last year's Galaxy S6 featured a 16 megapixel camera sensor, so when the supposedly leaked image showed us that the Galaxy S7 has a 12.2 megapixel sensor, we became skeptical. Although some manufacturers like HTC have been using larger pixel size or "ultrapixels" to justify a lower megapixel count, it is unlikely that Samsung would follow the same path since the recently announced Samsung Britcell sensor actually has smaller pixels. The image also shows us that the front camera has a 5 megapixel sensor and that too, does not seem to us as something that the Korean electronics giant will put in the final version of their upcoming flagship device. The leaked snap apparently reveals to us other specifications like a QHD 5.7 inch display, 4GB of RAM, a fingerprint sensor and a Qualcomm Snapdragon 820 processor coupled with an Adreno 530 GPU instead of the Exynos 8890 SoC. We believe the Quad High Definition 5.7 inch display is something that we can definitely see in the Galaxy S7. Even if there is just a 5.1 inch version at launch, we are pretty sure that Samsung will launch 5.7 inch editions eventually. The 4GB RAM is almost a certainty and so is the fingerprint scanner. In order to confirm our suspicions, we will have to wait till "Samsung Unpacked 2016," which will probably be held on 20th Feb, 2016 in Barcelona. In spite of Samsung's best attempts, it seems like keeping the Galaxy S8 a secret isn't something that's possible. 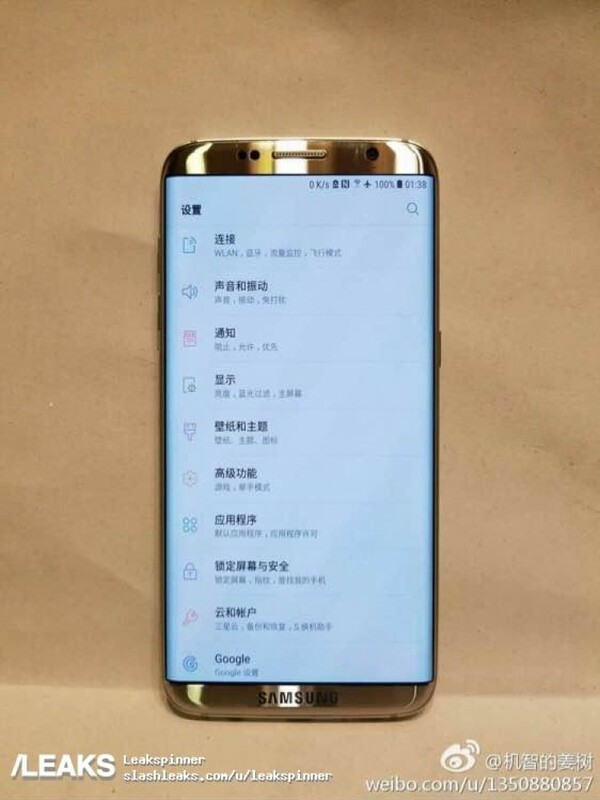 It was just two days ago that we came across quite a few alleged leaked renders of the S8 on Twitter and now we have an actual live image. This image was published on Weibo and was brought to us by SamMobile. What we see here is an image of a Samsung phone in gold, which doesn't have a Home button and sports a very high screen to body ratio. Although the image ticks some of the right boxes set forward so far by the rumor mill, the soft navigation keys are suspiciously missing. Also, the bezel at the top seems noticeably bigger than the one below. We are not saying that it HAS to be a fake, but the chances are pretty high! Besides, if this is the S8, it doesn't look very impressive now does it? Even if it is a fake, Samsung will have a hard time keeping everything under a lid, especially since the launch date has now been reportedly shifted to April; which gives leaksters even more time to try and bring unrevealed secrets about the Galaxy S8 to the public. Two of the biggest Android flagships of 2016 are going to be unveiled at the Mobile World Congress 2016 on February 21 and rumors regarding the two have reached an all time high now. As you probably know already, we are talking about the Samsung Galaxy S7 series and the LG G5. 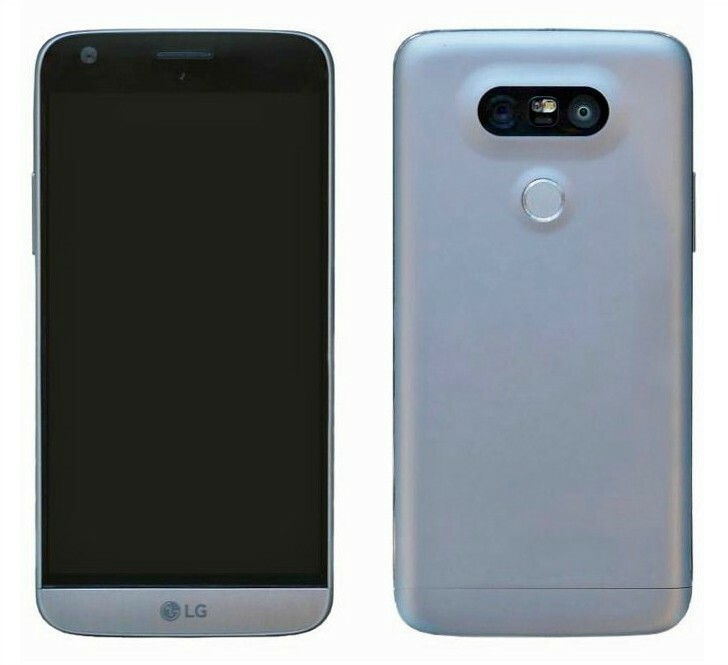 After being treated to a host of leaked Galaxy S7 and S7 Edge pictures on the web, we have finally been shown what the LG G5 will look like. This is the most revealing leak yet as we can clearly see both the back and the front of the LG flagship, which removes any doubt regarding its design elements at least. As seen in the picture, there is indeed a dual camera setup on the back, complete with a dual tone flash and possibly even laser autofocus. A circular fingerprint scanner can be seen right below the rear cameras with volume buttons on the side. If we were to make a guess, we would say that this time around, the fingerprint scanner will function as the power button as well. The body of the G5 is probably made up of metal, but it is hard to tell until we get a closer look at it. The internal specs of the G5 cannot exactly be seen in this picture, but after months of speculations, leaks and rumors we have a pretty good idea about them. Expect the LG G5 to be powered by a SD 820 SoC, coupled with 4GB of RAM and a powerful battery. The 5.6" 1440p display will sport Android M 6.0 out of the box and will possibly be updated to the latest firmware soon after. Although nothing has been confirmed officially, February 21 is most likely to be the day on which the Galaxy S7 will be unveiled. Being among the most popular upcoming Android flagships in 2016, there have been plenty of "leaks" about its design in the last few months and we will try to list the best ones here. Samsung' original: The "real thing"
This is the one that most experts and fans think is the most realistic portrayal of the Galaxy S7 yet. The image shows two renders, the smaller Galaxy S7 with a 5.1-inch screen and the curved Galaxy S7 Edge with a 5.5-inch display. 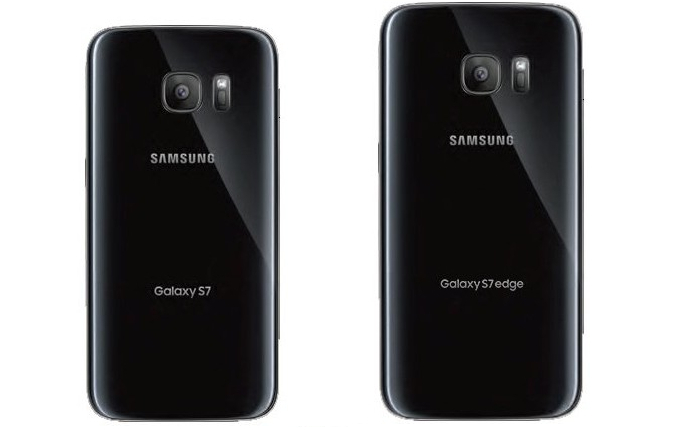 This seems to be the most reasonable as it looks quite identical to the S6's design. It only makes sense that Samsung would not reinvent a design completely after it did so just last year when it released the S6 and especially since it was such a hit. If you did not know already, you could easily be fooled into believing that one of Jermain Smit's renders is actually a teaser released by Samsung. His YouTube video looks surprisingly like a Samsung teaser and the beautifully rendered devices that he shows definitely seem to be bordering on the real thing. Other famous concept artists like Hasan Kaymak and Martin Hajek had different ideas and in their own respective visions, the Galaxy S7 was seen in brand new redesigned avatars. Some of them were downright brilliant, but too innovative to be implemented in the S7 this year, while others added more functionality and aesthetics to it in the form of duoscopic camera sensors and a real leather finish.